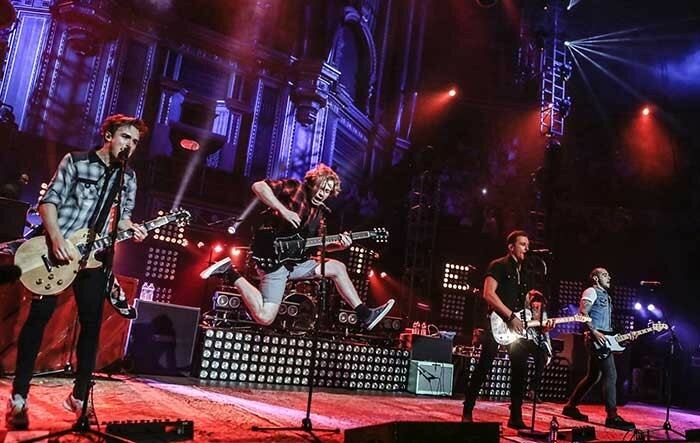 Chart topping, award winning and enduringly popular UK pop rockers McFly celebrated ten years at the forefront of the music industry with great panache – and some help from Robe’s latest technology – in four sold-out shows at London’s Royal Albert Hall. The RAH’s lighting department was appointed as lighting contractors, and senior technical manager Ollie Jeffery contacted award winning international lighting designer Tim Routledge to create a design using their own extensive house rig which features 130 moving lights, plus a large quantity of specials, including 24 Robe ROBIN Pointes and 40 Robe ROBIN LEDBeam 100s. 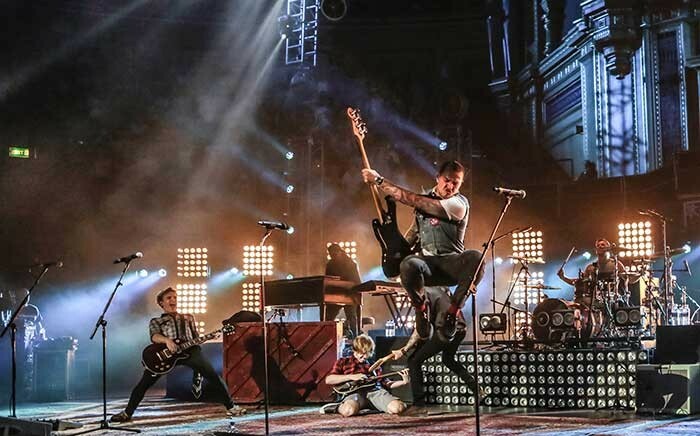 The brief to Routledge from McFly’s management was to craft a stunning looking, memorable show fitting to the occasion which embraced and included the impressive visual attributes of the RAH, including its grand organ. The venue has recently taken delivery of a quantity of architectural LED lights to illuminate unique elements like the organ and the roof. Routledge’s design was therefore based on ‘high and wide’ structural dimensions to show off the hall’s spatiality and the Victorian splendour of the stage area in front of the organ. Six flown vertical trusses made a chevron either side of the organ pipework and four vertical trusses on floor bases, left and right of the organ completed the pictures. The 24 Pointes were all deployed in multiples of four in the six flown trusses and at the bottom of each one was a Patten 2013, a custom vintage dish light designed and developed by Routledge. The LEDBeam 100s crowned a low level wall of Jarags curving around behind the band’s backline. It was the first time that Routledge had used Robe’s new Pointe fixture, which was launched at Prolight+Sound 2013 in Frankfurt and has quickly became Robe’s fastest ever selling product. He did not start using them until about half way through the high energy show and once he did, they had a profound impact on the look and feel of the lighting and the dynamism coming off stage. Features that Routledge especially likes include the lenticular prism and the rotating prism, both of which enable some unique and different laser-like effects which can have colours zapped through them. He also likes the snapping frosts and a number of other cool high-speed effects. He used them for big wide-fan beam looks into the audience, which could then instantly be snapped back to stage such is the speed and manoeuvrability of the Pointe. “They are super bright and quick, really robust and have loads of useful tools,” he comments. The LEDBeams were used for back-effects and beams and for filling gaps in the camera shots, In addition to those around the back wall, another 16 framed the front arch of the stage. Saturday night’s show was shot for a commemorative DVD and also streamed live on the internet, so oodles of camera-candy and big ‘televisual’ looks were the order of the day. 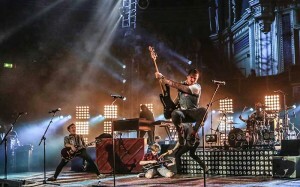 Routledge is “really into” small lights and numerous point sources at the moment and had also used the LEDBeam 100s a couple of weeks earlier at the BBC’s Proms in the Park event in Hyde Park. “They are very flexible – an excellent ‘flash-and-bash’ tool on one hand and also excellent for making up simple, bold architectural looks. The LEDBeam 100 is absolutely the favourite in my toolbox at the moment,” he declares! 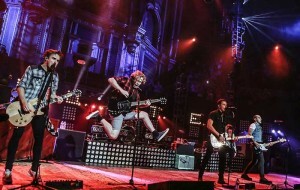 Routledge programmed and ran lighting for the McFly shows on the house grandMA2 console after prepping it by WYSIWYG in his own studio in south west London. Tim has just won the ‘Philips Entertainment Award for Outstanding Achievement in Lighting’, which was presented by the Theatre’s Trust at the first ever Technical Theatre Awards (TTAs) during the 2013 PLASA lighting & sound exhibition in London.